Almost always, my posts have discussed or featured events from around the world. This is a rare case when I can report on something that is happening (literally) in my own backyard and region. The entire central portion of the USA has been hit by a “historic” storm of unusual violence. The first link was issued just before it hit and warned it would affect 70 million people in many states. Severe blizzards, flooding, and dangerous winds were predicted. All these predictions came true. The second link explains why this was a historic storm and adds details about its severity. 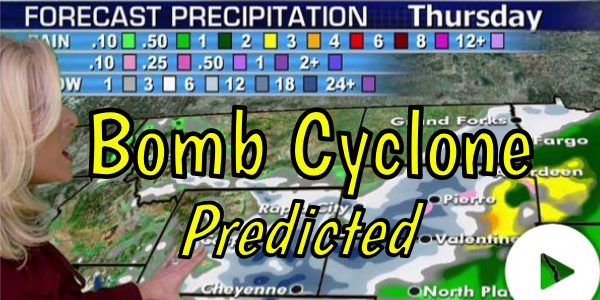 It was described by meteorologists as a “bomb cyclone” storm which experienced “bombogenesis” as the pressure dropped precipitously fast in the eye of the storm. It dropped 24 millibars of pressure in less than 24 hours to qualify for these superlative labels. I have never heard these climatological terms before. For those who were not in this storm, imagine a “snow hurricane” or cold rain hitting with the wind velocity of a CAT-1 or CAT-2 hurricane. Winds over 80 mph and 100 mph were recorded in Colorado, New Mexico, and Texas. The third link shows how such high winds lifted up and blew over a semi-truck on a Texas highway. In my state, the western and central portions experienced incredible snowfall and massive drifting and blizzards due to the high winds. In the eastern part of our state (where I live) we had over 2.5 inches of rain that came with high winds. This rain fell on land which already had a lot of snow on it and the ground was frozen so it couldn’t absorb the moisture. My city of Sioux Falls had the worst flooding since 1964 according to some local reports. Street intersections flooded which had never been flooded in my 31 years of living here. Some motorists had to abandon cars in rising street flooding only to discover their cars were later embedded in ice after the flood waters froze when the temperature dropped below freezing. I’ve included a montage of photos about the blizzard and flooding in my state in the fourth link (scroll down to a small box labeled “87 photos” and click on it). The number of photos is steadily rising so there may be more photos in that small box by the time you read this. I hope it includes the photo of a farmer trying to dig his cow out of a snowdrift that had completely buried the still-living creature. One multi-story building in downtown Sioux Falls had its lower level parking garage filled with floodwaters…which froze overnight. This storm has had very serious consequences for many people. A large dam collapsed in Nebraska, causing great damage and the evacuation of several towns which were inundated by the released waters (see the fifth link for a photo of the broken dam). In my state, the Gavins Point Dam in Yankton, SD, a large dam operated by the Army Corps of Engineers, steadily increased its water discharge from a more usual 17,000 cfs (cubic feet per second) to a peak of 100,000 CFS (sixth link) to release the excessive volume of water held back by the dam (and maybe to save the dam itself). The seventh link (a video clip) shows this, dam and the discharge of water it expelled when it discharged one million gallons per second during a previous flood in 2011 during a much more localized weather event. I can relate to that video as I stood at that very spot in 2011 where and when this video was filmed. The roar of the water was deafening and a friend and I watched trees on the far side of the Missouri River being ripped out of the river-bank and carried downstream). The eighth link, ninth link and tenth link offer more information about the damage done throughout our region and they focus on the damage done in the state of Nebraska. The flood waters shut down a US Air Force Base south of Omaha, and so threatened a nuclear power plant it had to be taken off-line. As you scroll through the montage of damage in the links, please realize that this is only a tiny fraction of what people in many states are experiencing. Was I affected by the storm? Yes. Being warned about its approach, my daughter and I shoveled the snow away from our home’s foundation before it arrived to minimize damage. However, the snow was mid-calf to knee deep in parts of our yard when we received over 2.5 inches of cold rain very quickly. I shoveled a melt path during the rain through the snow/slush to direct water from the backyard to the city street, and this path quickly turned into a swift river of water going by our house as our backyard drained its water. Even so, water did enter the lower level of our home through the foundation (our sump pump worked OK), and we have had to move a lot of things, rip up soaked carpet pads, pull back carpets to dry them with fans, etc. Like thousands of others, we are on the waiting lists of the water remediation services in the region but do not expect even an initial visit until sometime next week. At least our situation is manageable and does not currently affect the entire lower level of our home The people whose houses have been flooded and basements filled with water are truly suffering. The local Fire Department was even doing water rescues with boats on local city streets during the storm. Going through this raging weather made me think of Leviticus 26:1-9 where God lists a series of blessings he will send when nations honor and obey him. One of these blessings is receiving “rain in due season” (verse 4) to ensure excellent crops and the blessings of a favorable climate. All over the world, nations are receiving waves of weather problems and disasters. Many parts of the world report droughts, floods, cyclones/hurricanes, etc. Lots of rain is falling in many places of the world when it is not coming “in due season.” No part of the world seems to be spared from weather problems which seem to be intensifying as time passes. Since it was prophesied that in the latter days all nations would forsake God and righteous living and that Satan would deceive mankind throughout all nations (II Timothy 3:1-9, Revelation 12:9), it follows that weather problems and curses will befall the earth as mankind turns away from God and his divine laws..and that is exactly what the Bible says will happen. In August 2018, I wrote a post entitled, The Land Will Spew You Out, which examines biblical prophecies that when people sin, the very land they live on will steadily turn against them. Since all nations are steadily rejecting God and God’s laws, the world’s climate should steadily get worse on a global basis. That is exactly what is happening. I urge you to read that post.